We're late. But we're done & ready to ship the first 100 kits! Listen to our newest set of samples and take the electric x0xb0x acid test! Brushed aluminium panelsets came in today. Beta test successful...the final production run of PCBs have been ordered & should get to us in mid-April (or, hopefully, sooner). Which means we will be accepting orders in 2 weeks. Almost all of the parts for the 100 kits are in from various distributors. Cases are back ordered about a month, and getting the betas out took longer than expected...looking at perhaps at early/mid april for full release. Ugh its 4am and I'm dead tired...but Mark is finishing up recording some mini-samples for your enjoyment and I'm no quitter. With luck, more samples will appear next week. Last of the rare transistors (AN6562) came in today from Dalbani. Woo! So where are those samples you promised 2 weeks ago? Trust me, I want to see them soon too. We took some samples but we need to re-record them :( Its a little tough when there's only one actual synthesizer shared between 3 people working with it. I know two weeks seems like a long time but considering we've been working on this project for a year...Well, you can be assured that we are working on this project every day. Your patience is very much appreciated. Beta-test PCBs have been ordered, final BOM and beta-test parts ordering is underway. If you hadn't noticed, the website has moved to ladyada.net, which I hope will be less flaky. Both ladyada.net and the media.mit.edu versions are still up but not for long. Please update your links and refer to the x0xb0x page via "http://www.ladyada.net/make/x0xb0x". Thanks. Will there be mods (i.e. Devilfish)? Will it run on batteries? 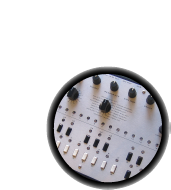 Some of the 'Devilfish' updates to the TB303 are built into the design (i.e. override accent and slide, because it was easy to incorperate and does not affect kit costs) However, in general, mods were not considered. There is plenty of space both on the IO panel and main panel for more pots, sliders, buttons, jacks, etc, etc. Hopefully, users will create their own mods and provide instructions for people who want to hack a x0xb0x. Perhaps they will even be available from Robin W? Robin is not interested in offering this service. However, it will be a popular mod and will eventually make its way to the mods page. Likewise, the x0xb0x does not have battery power 'built-in' but it would be trivial to add, and there is plenty of space in the box for a battery pack (which we did consider). Are all of them spoken for? Yes and no. We have more than 100 people on the waiting list but since no money has exchanged hands, there may be fewer than 100 orders when we go through the list. If you're interested please put yourself on the waiting list, which is first-come-first-served. Can I get an acrylic front panel? All kits come with aluminium panels. Acrylic has a tendancy to crack and shatter when under stress and probably wouldn't last a week. Today we ordered 16,000 2SC536Fs & sent off the 100 aluminium panels to be cut. Are you only making 100 kits? Are any left? Our initial run is 100. We have the parts to make that many on hand/available. Since we have already received more than 100 preorders, it seems likely that we will do a run of 500 (which is why I am now the proud posessor of 16,000 2SC536Fs!) There will be a gap of a month between runs as we reinvest from the first run into the second. If you're interested you should still email us, since not everyone who requested to be put on the mailing list will actually buy one. When will samples be up? Will you ship to _____? When will the design be released? Clearly not until it's been 100% finalized! Probably after we have sold 50 kits, perhaps earlier. When is x0xb0x going to be available? The end of March seems to be the most realistic time for a full release. The hardware design is completed and 75% of the firmware is done. (Gotta get back to work on the track write :) We want to do a 3 week beta test, since the design is complex enough.